This is my third and final card for the CAS Winter Design Team Challenges over at Splitcoast. I’m so honored to be in the top 10! For this challenge, Denise has asked us to show her something we’d eat or drink at her holiday movie party. Who doesn’t love chocolate? There are always lots of chocolates around at Christmas time. A little girl, many years ago would take a chocolate out of the box, take a bite and then put it back. Let’s just say she was a somewhat finicky eater, even when it came to chocolate! Needless to say, her parents weren’t thrilled with this…LOL! And to protect the innocent, I will NOT be revealing this little girl’s name…and will leave it up to your imagination. OK…on to the card. The card base is a standard A2 in SU! Early Espresso. Next comes a layer of white card stock that has a computer generated sentiment and some dry embossing. 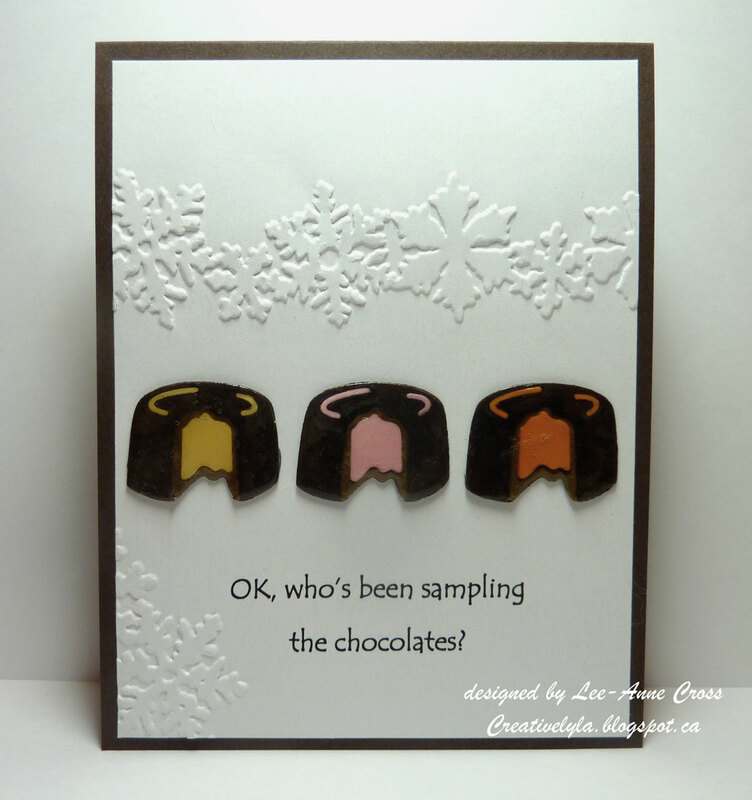 The chocolates were made with a Sizzix die called Chocolates…how very appropriate right? This die allows you to pull apart different sections and color them as you wish. So I matched the little squiggles on the top with the center and then around each center is a layer that looks like a caramel filling. I cut the main chocolate twice for each and then glued all the little parts onto this backing for stability. Then, and it’s really hard to see in the photo, each chocolate has been covered with Ranger Glossy Accents. They were attached to the card with glue dots.